Antonia Majaca and Ivana Bago — the curators of ‘Stalking with Stories: The Pioneers of the Immemorable’ — may not be responsible for the present overuse of text in visual art, which reached its baroque phase at the last Whitney Biennial, but their show is symptomatic of a larger problem that plagues many philosophically drunk group shows: there’s very little to look at. The impetus for the show was a pair of questions: “What do we remember? How do we remember and retell stories of the past?” Having read the press release, I was eager to see how the curators would work out an exhibition described as a kind of visual game of Telephone, one in which narrative would be spontaneous and take on lives of its own. But one look at the show’s accompanying brochure revealed the overconceptualizing that I feared, complete with footnotes. Enter Svetlana Boym and Giorgio Agamben; you could see that there was little room for the kind of storytelling an image can impart. Intellectualization can be harmless enough, but in this case, academically obtuse notions of the story as simultaneously retrospective, nostalgic, and forward-looking seemed to have trumped any impulse to show works of visual art. The exhibition was sealed in a bubble; the curators (and some of the artists) may have been so concerned about potential misinterpretation that they avoided all potentially messy contact, as pleasurable as that can be. Ahmet Ögüt’s Devrim (Revolution), 2005, and Katerina Seda’s It Doesn’t Matter, 2005, were emblematic of the exhibition’s problems. In each, the artists did the heavy lifting for both the curators and the viewer. A strenuous emphasis on text became part of the work itself, almost like another, mixed-media press release. Suggesting some insecurity on the part of the artists, their work seemed driven by an impulse to explain meaning that should have been implied. 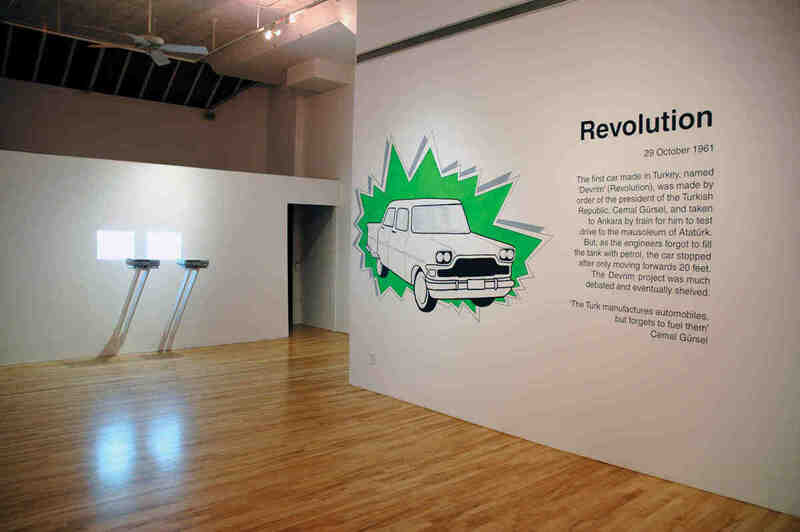 Devrim (Revolution) was a wall drawing of text and a cheerful, purposely naive, ad-like image of a car. We were informed that it was a Devrim car, produced in Turkey, and that to publicize it, the Turkish president was taken for a ride — but the car only made it twenty feet before stopping; the engineers had forgotten to put gas in it. It Doesn’t Matter depicted the artist’s struggle to connect with her grandmother, who’s grown apathetic and withdrawn. Seda asked her to recreate the catalogue of items sold in the tool shop where she worked in socialist Czechoslovakia. A video showed the grandmother discussing the tools as she drew them and was accompanied by a book detailing each drawing and a wall text in which the artist described her motives and feelings about the task she had given to her grandmother. These stories were certainly worth telling, but they were presented, as it were, on a one-way street, where images only served ideas and were of little value in and of themselves. With so many descriptive elements — video, drawings, and text — the works were explained to death. Seda went even a step further and literally spelled out her feelings and inner motives. So what were we left to discover? It was all there for us to consume, like a frozen dinner we could guess the taste of before we even opened the box. I feel infantilized walking through shows like this, where I’m either presumed dumb and condescended to or excluded completely, where either content is spoon-fed or an unreasonable degree of arcane knowledge is required to grasp the most fundamental part of the work, namely, its subject matter. Is this how curators and artists make themselves feel needed? One exception was Felix Gmelin’s Farbtest, Die Rote Fahne II (2002), which engaged the show’s mandate in captivating fashion. Two videos were juxtaposed, one shot in 1968 showing the artist’s father and friends running through West Berlin, handing off a red flag as if in a relay race to join other activists who were never found. The other video was a recreation of the 1968 film, this time featuring the artist and his friends, shot in 2002 in Stockholm. All the works in the show demonstrated the curators’ precise thesis: that in every new telling, stories are adjusted and “perfected,” ultimately hijacked in the interests of the moment. But Gmelin’s work was the only one that managed to synthesize idea and image — in his work, the themes of time, memory, and longing were present in the subtlest manner. In those silent, side-by-side images of idealistic and breathless young and once-young men endlessly rushing toward the camera with their vivid flags beating behind them, the simultaneity of nostalgia and the aspirations of storytelling and retelling were beautifully articulated — no explanation required.